Every year the IRS makes adjustments to retirement contribution limitations for inflation. 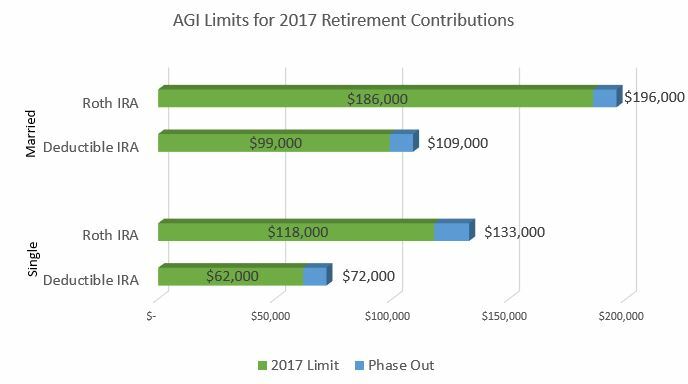 For 2017, most savings contribution limits remained the same with the exception of the SEP/401(k) and individual HSA limits. The maximum SEP / 401(k) contributions went up from $53,000 to $54,000 (plus $6,000 for those age 50 and older). 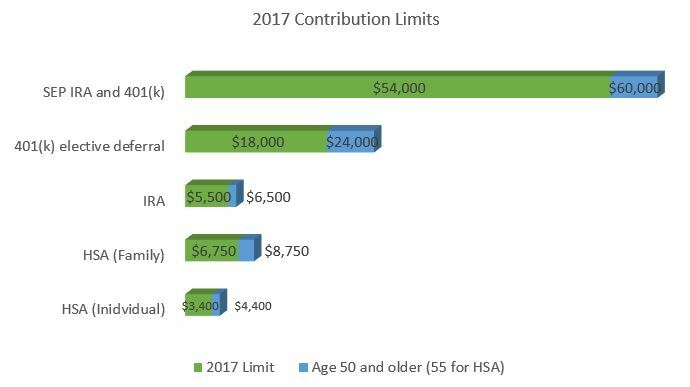 The individual HSA contribution limit went from $3,350 to $3,400 (plus $1,000 for those age 55 and older). Below are the contribution limits for 2017. This is a small increase to the standard deduction which will reduce the tax owed for those who do not itemize deductions. Seniors will have the same hurdle as younger taxpayers to claim an itemized deduction for medical expenses. This large increase in the Social Security wage base means that individuals who reach the max on Social Security taxes will owe an additional $539 this year. For those with taxable estates, the exemption goes up slightly.